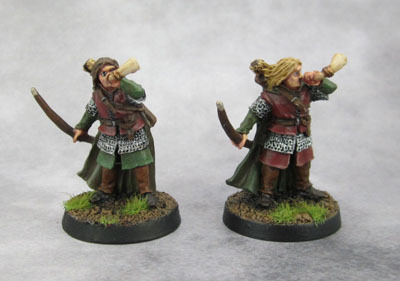 Blackroot Vale Archers | Azazel's Bitz Box. It’s back to Lord of the Rings models for this post. Showing off some models recently painted, as well as some models a little less so. 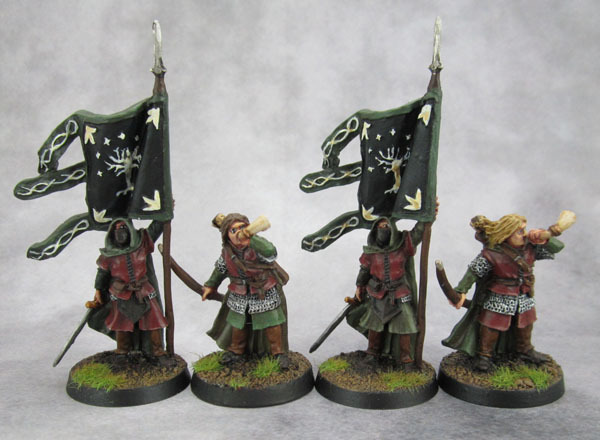 These four – 2 of each sculpt – are the Citadel Blackroot Vale Archers Command. Some of the last waves of metals I bought from Maelstrom Games shortly before GW brought into place the ROW embargo onto UK retailers and customers in Australia, New Zealand and elsewhere. Banner Bearers of Blackroot Vale. Or Ithillien. They’re reasonable models, though the sculpts are nothing special. Solidly on a par with many Historical sculpts – though far more expensive – and not up to the same high standard that much of the LotR range is. It appears that I started them about a year ago, and finally forced myself to get rid of them from my painting desk a couple of weeks ago by knuckling down and completing them. I’m not sure why GW decided to go with the Blackroot Vale moniker, as they’re not really correct for those troops anyway and Faramir’s Rangers lacked a command section for WotR or so forth. In my thinking they’ll be used (thematically) as part of the wider force of the Rangers of Osgilliath. Two command stands, only a year late for their comrades. 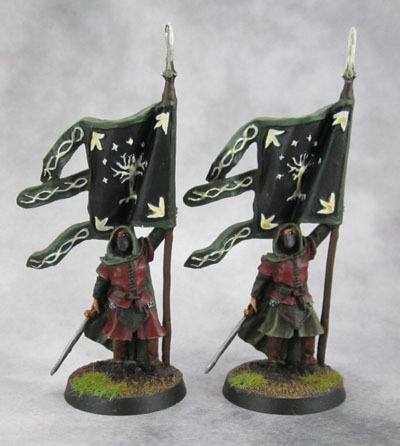 They were the final models needed to complete these two units for my Kings of War Army of Gondor. I had thought these were painted earlier this year, but looking through my painting list it seems they were actually finished in July last year – the first batch one day off from a year earlier to their commanders. The troops, made from the Rangers of Middle Earth catch-all plastic box are to be quite blunt – poor models as far as modern HIPS plastic kits go. Softly and mushily detailed, slightly oversized to the rest of the LotR range, and featuring overly-chunky details in their cloaks and clothing. They are a lazy boxed set marketed in a lazy manner – replacing all of the previous metal ranges of rangers. 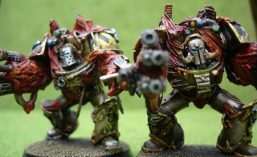 I’m ok with mine – as I got them all second-hand from eBay – and seeing what the sculpts were actually like I decided to paint them with the effort that they deserved. So I used base coats in a series of naturalistic colours, added minimal highlighting, and washed them all in Army Painter Dark Tone (aka Devlan Mud). I did the skin in a speed-paint version of my usual way, and did bother to pick out the eyes, but they’re simple wargame models painted as simple wargame models – not as “nice” pieces. They look good enough and appropriate in a block on the table. I have a bunch of the “proper” metals, and they’ll be painted either this year or next since I want to finish off all of my Gondor (and Moria) stuff ASAP, but for the time being they’re down the priority list while I continue to try and clear other models from my desk. 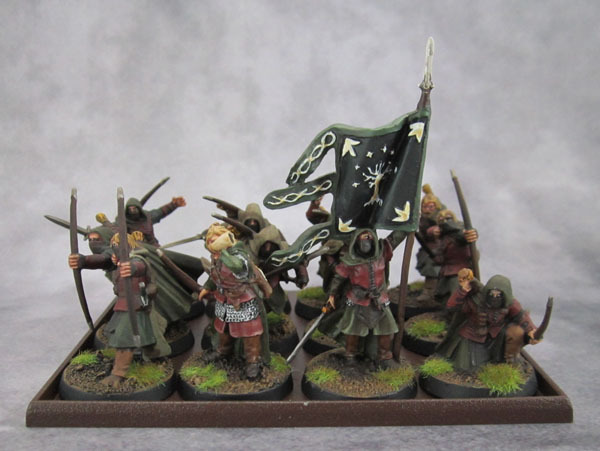 In the meantime if I get around to playing through the LotR scenarios in the SBG books, there’s enough of them painted now to cover most instances from the first several battles they appear in as well as two units for the mass battle KoW tabletop. 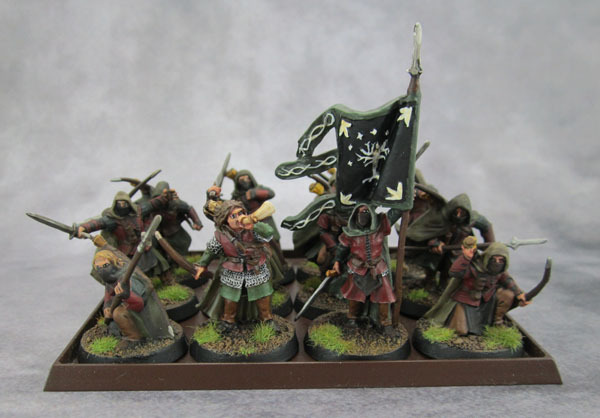 2 Regiments or 1 Horde of Gondor’s Finest Rangers.